Let’s face it! Purchasing fun and creative toys for kids today can be very expensive. Also there is a lot of peer pressure on parents to buy the latest and greatest toy which will help develop their kids skills. So, what can parents do? 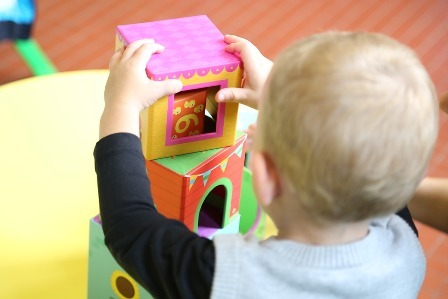 There are a lot of DIY options which will help kids with creativity, motor skills, eye-hand skills and social skills. Kids can help make the toys and decorate them! Do you have a sturdy old box? If so, it can be made into a car or walking/push toy. Here again, kids can decorate the outside of the car. If needed, parents can cut the sides down some, helping the kids get in and out of the car easily. Paper plates can be used for the tires, headlights and steering wheel. An older child or an adult can be the engine and push them around. When they are done playing “car” they could put their toys in it and push them around. It makes a nice storage place, too. A lot of things we store in our cabinets and don’t use can be become bathtub toys. Tin cups, plastic measuring cups, soap dishes and even styrofoam meat trays become boats. A cup can be used as a waterfall to sink the boats. Underwater boats become submarines which can sink other boats and the war is on! There’s so much imaginative play that is done in a tub of water! Add some bubbles and you have even more fun! When it’s time to get out of the tub, kids don’t even associate getting “clean” with all the playing time, making this a fun time rather than a “have to” routine.